Amazonite gemstone: A tumble-polished amazonite gemstone. Image copyright iStockphoto / Arpad Benedek. Amazonite, or Amazon stone, is a trade name given to a light green, bright green, or blue-green variety of microcline feldspar. Most specimens are translucent. Because there are very few blue or green gemstones, Amazonite’s color attracts almost immediate popularity. Tumbled amazonite: Tumbled-polished amazonite with typical microcline pattern. Image copyright iStockphoto / CORTUUM. Amazonite is sometimes tumbled, but it is not one of the most popular tumbling materials. 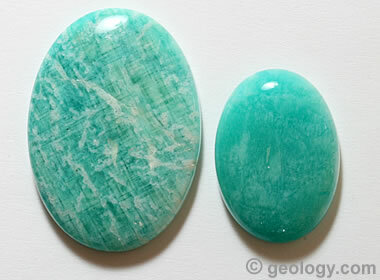 Much of the amazonite used to make gemstones is cut as cabochons. These are often set in earrings, pendants, and pins. 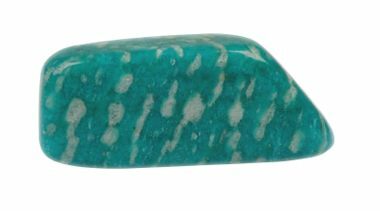 Amazonite has perfect cleavage in two directions, and that makes it less suited for use as a ring stone. A small impact could cause it to crack or cleave. 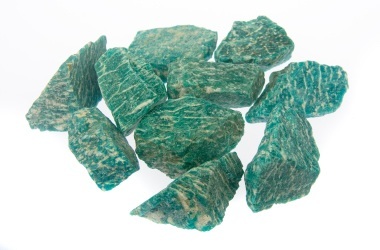 Amazonite is a good tumbling rough for people who already have some experience using a rock tumbler. It has a hardness of six and will grind much more rapidly than agate, jasper, or quartz materials, so it should not be tumbled with them. It also cleaves easily during the tumbling process. Small pieces of amazonite will often break if tumbled with large-size materials. Tumbling amazonite with pellets or other shock-absorption media can reduce the amount of breakage. The green to blue-green color of amazonite is caused by a small amount of lead as an impurity within the microcline. Amazonite rough: Amazonite rough with typical white veining. Image copyright iStockphoto / Roy Palmer.